A couple who planted a severed finger in a bowl of Wendy's chili in a scheme to extort money from the fast-food chain were sentenced Wednesday to prison terms of at least nine years. 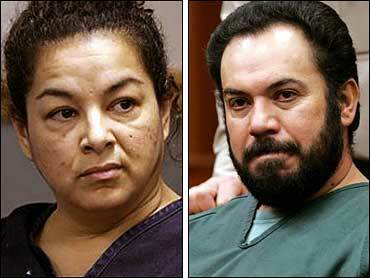 Anna Ayala, 40, who said she bit into the digit, was sentenced to nine years. Her husband, Jaime Plascencia, 44, who obtained the finger from a co-worker who lost it in a workplace accident, was sentenced to more than 12 years. "Greed and avarice overtook this couple," said Superior Court Judge Edward Davila, adding that the pair had "lost their moral compass." The two pleaded guilty in September to conspiracy to file a false insurance claim and attempted grand theft with damages exceeding $2.5 million. In a tearful plea for leniency, Ayala apologized to the courtroom gallery and said the scheme was "a moment of poor judgment." She said she retched March 22 after biting into the fingertip while dining with her family at a Wendy's in San Jose. Forensic tests later showed Ayala never chomped down on the finger, but she described the incident to television news crews. "There's no words to describe what I felt. It's sick, it's disgusting," she said in a clip played before sentencing. "Just knowing there was a human remain in my mouth is tearing me apart inside." Although authorities suspected a hoax, in part because the finger was not cooked, word of the stomach-turning find quickly spread around the world. The Dublin, Ohio-based fast food chain claimed it lost $2.5 million in sales because of the bad publicity, and dozens of workers at the company's Northern California franchises were laid off. The sentencing followed a 90-minute hearing in which several Wendy's employees testified, including the man who made the chili and the cashier who helped Ayala on the day she made the claim. "I felt so bad for the fear of what people would think of me," said Hector Pineda, who made the chili and initially came under suspicion. "We are the ones that have suffered." No Wendy's employee was missing a digit at the San Jose restaurant, and no chili suppliers reported finger injuries at their plants. In April, Ayala was arrested at her suburban Las Vegas home. Investigators found a pattern of legal claims she brought against businesses in her name or for her children. A lengthy search for the finger's owner eventually pointed to one of Plascencia's co-workers, who lost it in an accident at the paving company where they worked, police said. Plascencia bought the tip of Brian Rossiter's right ring finger for $100 and told him what he and Ayala were plotting, according to court documents. Rossiter later told police the couple offered him $250,000 to keep quiet. During a recorded jailhouse phone call, Ayala bragged about how other inmates were asking for her autograph, according to a transcript of the call.